Have you ever wanted to access the BeerSmith blog on the go? We recently added an iphone/mobile friendly version of the blog. 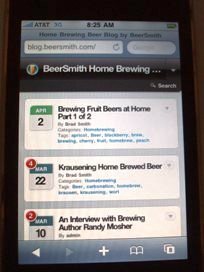 If you access the BeerSmith blog from your iphone, blackberry or many other mobile devices, you will now see that it has been formatted into a phone friendly theme. If you want to access the blog from any web browser, you can use the new shortcut: blog.beersmith.com – recommend it to your friends! If you prefer to use your kindle, we now have the BeerSmith blog available in that form as well. You can subscribe to receive blog articles on your kindle from the Amazon store here. As with all of Amazon’s kindle blog subscriptions, there is a $1.99 monthly fee (full disclosure – a very small cut comes back to support the blog) for delivery though a 20 day trial is free. Very nice! Really like this, thank you! A lot of people will appreciate this. I’ve got an iTouch and will probably be enjoying the site on that when I have a chance. I really hope to get an iPhone when I move out of an area that is only Verizon and Sprint. Were you guys finding a lot of people were using iPhones to access your site? Or did you just decide to do it because mobile is becoming so popular? I actually decided to do this because I recently got an iphone and enjoyed it – I figured many others would enjoy it as well.